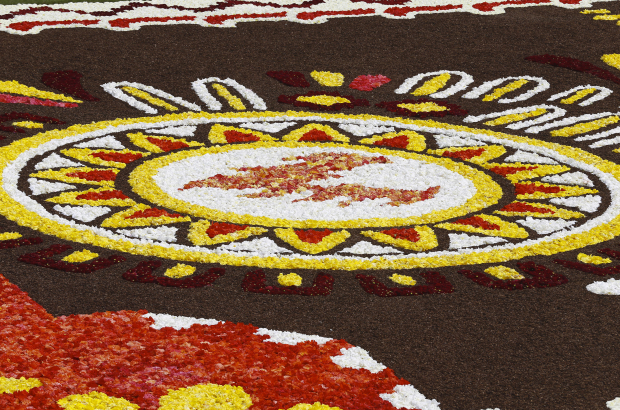 Why is the Brussels flower carpet not recycled? We're all encouraged to throw our garden waste in green bags to be recycled - but the 700,000 flowers that made up this weekend's Brussels flower carpet are heading straight to the incinerator. Street cleaners from Bruxelles-Propreté removed the floral display in the early hours of Monday morning. To speed up the clean-up operation, the carpet is built on sheets of plastic that cover the cobblestones of the Grand-Place and are then folded up to contain the wilting flowers. Brussels city councillor for tourism, Karine Lalieux, said: "It we didn't wrap the flowers up in plastic, it would take a lot more time to remove them from the Grand-Place. We could look at other ways, but it's very complicated." To be composted, the flowers would have to be removed by hand and sorted to remove any non-biodegradable litter that has made its way on to the carpet. A spokesman for Bruxelles-Propreté said there was another complication: "These flowers are often chemically treated and so we cannot include them in the compost because of the risk of soil pollution." The Flemish producers who supply the begonias for the flower carpet disagree. They say there are no or very few chemicals in their crops and that their flowers are used in similar installations in the Netherlands that are successfully recycled.